I put off being a parent until I was 40 as I was so scared of messing it up. I wanted to be able to parent differently from the way I was parented and I wanted my child to grow up confident and secure. I felt that there must be a better way to parent from the traditional methods and I wanted to find out what they were. I scoured the Melbourne’s Child magazine for an advertisement for parent training and found a small advertisement amongst the multitude of advisements and signed up for Parent Effectiveness Training P.E.T. when my child was only 3 months old. I found that even at such a young age learning the parenting skills from the course enabled me to speak to my child differently and I got a noticeably different responses. When my child grizzled while I changed his nappy instead of telling him to shhh, I used active listening and said, ‘you are not really enjoying having your nappy changed’ and he quietened. 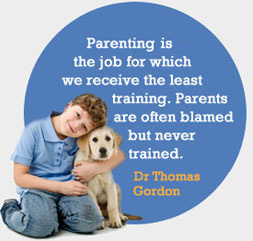 I also understood that annoying behaviours from my child were simply a result of him trying to get his needs met. Once I understood this I was able to help him get his needs met and he stopped his annoying behaviour. When the terrible twos and threes came along I was able to manage most situations without resorting to punishments that I felt were unfair and involved force or removing favourite toys. Some of my other friends were using rewards and punishments but this did not feel right to me. I feel that I have a wonderful relationship with my son and the majority of the time I really enjoy his company. He seems very respectful of me and others and I am hoping that the good relationships and patterns developed while he is young will enable him to trust me as he becomes a teenager. I feel that I am in a good position to ‘avoid being fired my son when he becomes a teenager’. Dr Sarah Buckley, author of “Gentle Birth, Gentle Mothering”. The final chapter, Gentle Discipline, is based entirely on her experience of using Parent Effectiveness Training in her family.